Low Sze Wee is the Director of the Curatorial and Collections department at the National Gallery Singapore (NGS) which is scheduled to open in 2015. Low began his journey as an assistant curator for the Singapore Art Museum (SAM) in 2001, then becoming the deputy director of the curatorial and collections department. In 2009, he joined the Gallery in the early stages of its conception and continued building up the museum's collection while overseeing its curatorial development. The Gallery will focus on displaying Southeast Asian art, with a special emphasis on Singaporean art, from the 19th century to present day. The National Heritage Board (NHB) of Singapore is a custodian of more than 10,000 works of art from the region, and this collection will be a primary focus at the Gallery. The Gallery occupies two important heritage buildings symbolic of Singapore’s nationhood, the City Hall and the former Supreme Court buildings. 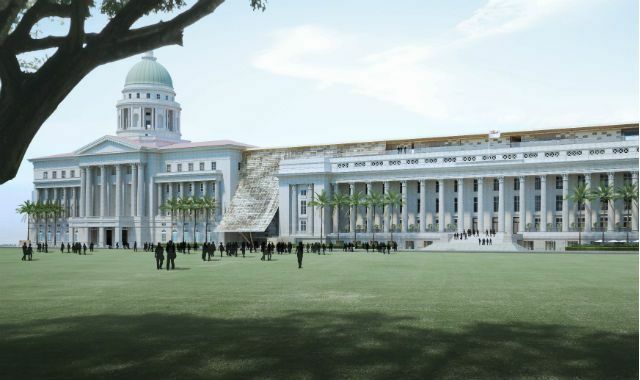 At a total gross floor area of approximately 64,000 square metres, it will be the largest visual arts institution in Singapore, matching established museums such as Musée d’Orsay (France) and Tate Modern (UK) in size. Art Critic Bharti Lalwani finds out more about the curatorial direction of the new Gallery. BL: Sze Wee, before I ask about your role, I'm curious to know how you became active in the Singapore art scene. I gather that you were a lawyer but you went on to SOAS in London? LSW: When I started working as a litigation lawyer in 1996, it was also the year when SAM opened and started training its local volunteer museum guides. I was part of that inaugural batch and grew to love bringing visitors around SAM’s exhibitions and sharing my passion for art with them. After two years of guiding on weekends, I became more familiar with the local art scene and came to realise that a career in the arts was a viable option! And for me, it became increasingly clear that job satisfaction mattered more than financial rewards. Hence, I decided to opt for a career change in 1998, and headed to London to further my studies in art history at SOAS (School of Oriental and Africa Studies). BL: How has your role expanded over the years- Before joining the Gallery you were overseeing the curatorial and collections department at SAM, how is your current role different? What are your responsibilities? LSW: I first started as an assistant curator at SAM in 2001. It was a steep learning curve, as I had to learn, on the job, how to put an exhibition together – an always-challenging balance of art historical research, audience engagement, relationship-building and project management. Over the years, as I was given more responsibilities in managing the curatorial and collections department at SAM, I gradually understood what it meant to curate exhibitions and build up a collection in a national museum, and how such a museum operates within the local context. In my current role at the Gallery, my job is more akin to that of a start-up. All of us at the Gallery now have the exciting opportunity to set up a new museum from scratch – in terms of developing policies, building our teams, and more importantly, coming up with a new vision for what Singapore’s visual arts landscape could look like in the future. BL: Last year you were named one of the Fellows for the Clore Leadership Programme, making you the first Singaporean to be selected in the prestigious program's 10-year history. What does this training entail in terms of running the NGS? LSW: This is a programme that aims to shape aspiring leaders from across the creative and cultural sector through in-depth learning. These are tailored to the needs, aspirations and circumstances of the individual fellows, comprising residential courses, an extended placement, individually-selected training, mentoring and coaching. When I was in London, I had the opportunity to gain a better understanding of how various national art museums operate and their thought-processes. Whilst their circumstances are quite different from Singapore’s, it was reassuring to know that some of the challenges they face are not so different from ours! More importantly, it also provided a platform to forge deeper relationships and networks that could hopefully lead to fruitful collaborations in the future. BL: So what are the challenges facing NGS? LSW: As there is a need to build knowledge about Singapore and Southeast Asian art, and grow new audiences through our programmes, the challenge is for our exhibitions to be underpinned by strong research and intellectual rigour, and yet remain engaging and accessible at the same time. This ties in with the Gallery’s aim to be a leading visual arts institution that inspires and engages our audiences with the art of Singapore, Southeast Asia and the world. Some spaces within the Gallery are designed for interactivity and engagement with art. For instance, the Keppel Centre for Art Education is a unique space specially designed and programmed for school children and families. It will provide fun, multi-sensory learning opportunities for children of all ages. Special programming spaces will also be opened throughout the day. Visitors can enjoy talks and seminars on art-related topics, workshops, art demonstrations, film screenings, art appreciation classes, and many more exciting activities. BL: The Gallery’s website states that they will focus on displaying art "from the 19th century to present day". Does this mean the museum doubles as an exhibition venue for Modern and Contemporary art? LSW: The Gallery will have a number of exhibition spaces. We will have the Singapore and Southeast Asian Galleries – these are two spaces which will have long-term displays of Singapore and Southeast Asian works, drawn primarily from the national collection. These works will be from the 19th century to present day, as the aim of these two galleries is to present the art histories of this region. In addition to these two galleries, we will also have galleries for short-term special exhibitions. For these special exhibitions, we hope to present a balanced mix of shows on Singapore, Southeast Asian and international art. In terms of time period, we are open to the possibilities of presenting art from across time, particularly if meaningful connections can be drawn to the artistic practices and audiences of the region. BL: Showcasing Singapore, Southeast Asian and international art overlaps with the aims of National Museum and SAM. How would NGS distinguish its programming? LSW: National Gallery Singapore is about the art histories of Singapore and Southeast Asia. Through our exhibitions and programmes, we aim to historicize the development of art in Singapore and Southeast Asia from the 19th century to the present day. Through our research and long-term exhibitions, we aim to present the art histories of Singapore and Southeast Asia, based on existing scholarship and understanding of how modern art in Singapore and Southeast Asia emerged and developed. We also aim to reflexively (re)write the art histories of Singapore and Southeast Asia through our research programmes and publications. Lastly, through our increased understanding of the art history of Singapore and Southeast Asia, we aim to examine the role of Southeast Asia within the global historical development of art through special exhibitions. While the Gallery focuses on the art of Singapore and Southeast Asia from the 19th century to the present, the Singapore Art Museum focuses on contemporary art. Both museums will complement each other and work closely together in making Singapore a vibrant arts hub. BL: Going in to the formation of NGS early on, was there a curatorial framework which guided the architect's oeuvre in creating a space for a Southeast Asian collection? LSW: There was constant dialogue between the curators and the architect because the latter needed to understand how the spaces would be used in the future. However, the architect also understood that there would be many ways to curate exhibitions, and art and scholarship would continue to evolve over time. Hence, it was also important that the spaces be flexible enough to cater to such future developments. BL: At a NHB organized conference in 2011, ‘Making a great art museum: Contending with Southeast Asian modernities and art', one of the speakers, playwright Huzir Sulaiman, amusingly said something to the effect of 'Don’t allow the museum to be used as a tool for State propaganda'. The NHB collection has been built through funding from the Ministry, so can one expect to see the full range of more provocative art from Singapore and the rest of Southeast Asia made pre and post war? Can one expect to see woodcuts, political cartoons or social realist artworks made during Japanese occupation and art made during the cold war- i.e. Works made by artists that do not conveniently suit State agenda? After all, Art is about free expression. LSW: National Gallery aims to present the art histories of Singapore and Southeast Asia. So, we will be showing works which are of art historical significance, including the social realist woodcuts made by Singapore artists in the 1950s. We hope that the local visual arts ecosystem will eventually be a multi-faceted one, where public museums, private museums, non-profit spaces, educational institutions and commercial galleries will each play specific but complementary roles, both in terms of collecting and research. "we will be showing works which are of art historical significance, including the social realist woodcuts made by Singapore artists in the 1950s." BL: At a recent public forum at an art fair in Singapore, you were on the panel with representatives of SAM, Centre for Contemporary Art (CCA) and Institute for Contemporary Art (ICA). I had asked how each institution would help foster discourse and independent criticism. Speaking for NGS, you replied that the museum will have an archive that will be available to the public for reference. I recall that in 2011 the NGS was extremely keen on acquiring Koh Nguang How's exhaustive archive, a significant section of which featured at the Singapore Biennale that year (30 years of art reportage in local news). But according to Koh, NGS dropped the plan citing budgetary constraints for new acquisitions. So, my question is two-fold. Firstly, if not Koh's extensive archives, how does the museum plan to build its own archival centre? Secondly, looking at the amount spent on the refurbishment of the two heritage buildings, at the time I was surprised to hear about budgetary constraints for acquisitions. A press release dated in December 2010 announced that refurbishment of the two heritage buildings is estimated around SGD 530 million. Is more money being spent on the exterior when it is the core collection that should ultimately matter? However, now that DBS has donated SGD 25 million "which will be matched dollar for dollar by the government from the Cultural Donation Matching Fund" according to one news report, can we expect an inspiring collection-curation and programming? LSW: For confidentiality reasons, we would not be able to discuss specific acquisition details. For our resource centre, we hope to work collaboratively with artists, artists’ families and researchers to collate archival materials that would be useful for future researchers. Koh Nguang How’s archive is significant, and we are interested to see how we could work with Koh to help make that available to the public. In terms of art acquisitions, this is an on-going exercise for all NHB museums. The national art collection has been built up over the past few decades, and we now have a collection of about 10,000 works from Singapore and Southeast Asia. We already have a number of historically significant art pieces, and we look forward to acquire, through our own resources as well as through artwork donations, other important works to complement the existing collection. "For our resource centre, we hope to work collaboratively with artists, artists’ families and researchers to collate archival materials that would be useful for future researchers." Bharti Lalwani is an art critic who contributes to The Art Newspaper, Harper's Bazaar Art Arabia, Eyeline (Australia), among others. Her research interests include Private museums as well as contemporary art from Southeast Asia, the Middle-East and West Africa. Through her writing and research she connects the emerging contemporary art histories of three continents. In 2014, she was nominated Forbes Art Writer of the Year (India).